I really shouldn’t complain. After all, I did it to myself. Months ago, when I was trying to figure out how I could possibly market the debut of one novel while writing the next, I devised “Marketing Mondays”. I set aside an entire day to focus on things like blog posts, Facebook fan page and website updates, Triberr re-posts, and gathering the data my publicist needs for the book launch. Not to mention developing my own mailing list and brainstorming ideas for contests and other release-party related ideas. Made perfect sense, really. In fact, I had been recommending the exact same strategy to clients for years. What WAS I thinking?!! Gads, how I now fear Mondays. It all starts with a prickling sensation on the back of my neck every Sunday evening, as I glance at the planner to get a feel for the week ahead. Not even an extra cup of my favorite honey-vanilla chamomile tea can ward off the dark dreams that follow. And then dawn breaks and there is dread coiled in the pit of my stomach. By the time I’ve poured the first mug of coffee, my palms are already perspiring. Who knew this would be so HARD? So many tasks and so few hours in the day. And as you all already know, I often fail to get to it all. But week after week I chip away at the monolithic ‘to do’ list with a toothpick and hope to do better than I did the week before. Because every little bit counts. It really does. 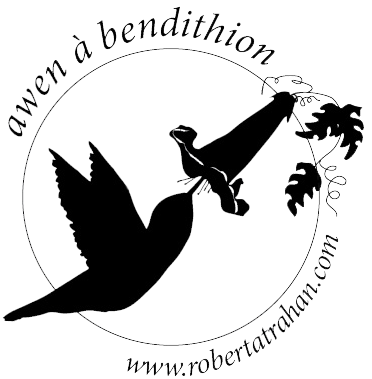 Awen a Bendithion is a Welsh phrase that I have adopted as my personal salutation, shared with me by a fellow writer years ago. I’ll tell you what it means one of these days :). This lovely artwork speaks to my family heritage and embodies my personal totem creature, the hummingbird. It’s job is to uniquely represent me and my author identity. You’ll be seeing it a lot soon — on my blog, facebook fan page, and promotional materials. Have you thought about creating something that speaks for you? Set Attainable Goals – one of my biggest stumbling blocks is the never ending ‘to do’ list. When I take it as a whole, it is insurmountable and since there are always things left to be done no matter how hard I try, I always end up feeling like I fell short. A better practice is to bite off small pieces — focus on a few selected tasks that can realistically be accomplished in the time you have available. Mix it Up – of course the most time sensitive task is the one that ought to get done first, but it is stressful to constantly be managing your priorities by catering to chaos. A helpful time management tool is to keep yourself working ahead of the curve by adding at least one or two items to your list that isn’t hanging precariously on a deadline. Delegate – many hands make light work, isn’t that what they say? Hire help, if you can. I use the lovely ladies at Beyond Novel because, frankly, this book is just too important to me to leave up to my own limited efforts. Knowing when to hand the work off is an important and powerful step toward achieving your marketing goals. Well, that wraps up another Marketing Monday for me. I’m off in search of dark chocolate and caffeine — I earned it!